Expanding on last year’s theme, it’s affordable housing week. The Ithaca Urban Renewal Agency will be holding public hearings on March 24th and 28th as part of the process to determine who will receive money from the Housing and Urban Development (HUD) grants awarded to the city. The 25 applicants (up from 21 last year) range from jobs training to community services to the development of affordable housing. All summed up, there’s $1.85 million requested, and $1.56 million available, so that means an 84% chance of funding, all parameters being equal. For comparison, in 2015, $1.78 million was requested out of $1.215 million available, just a little over two-thirds of the total. The chances for funding have gone up this year. Part of the reason for the better chances this year is unfortunate – the return of $273,869 in 2014 HOME funding meant for INHS’s 402 South Cayuga project that has not come to fruition. Although HOME funds can be awarded for rental projects, the funding was awarded by the city specifically for owner-occupied housing, so the money comes back into play. There’s also about $26,300 left over from last year that went unallocated. 1. Last year, INHS applied for and received almost $458k for 210 Hancock, for which site prep is currently underway. This year, they’re applying for funding for two projects – seven owner-occupied units at 202 Hancock (new tax parcel), and the single-family home planned for 304 Hector Street. 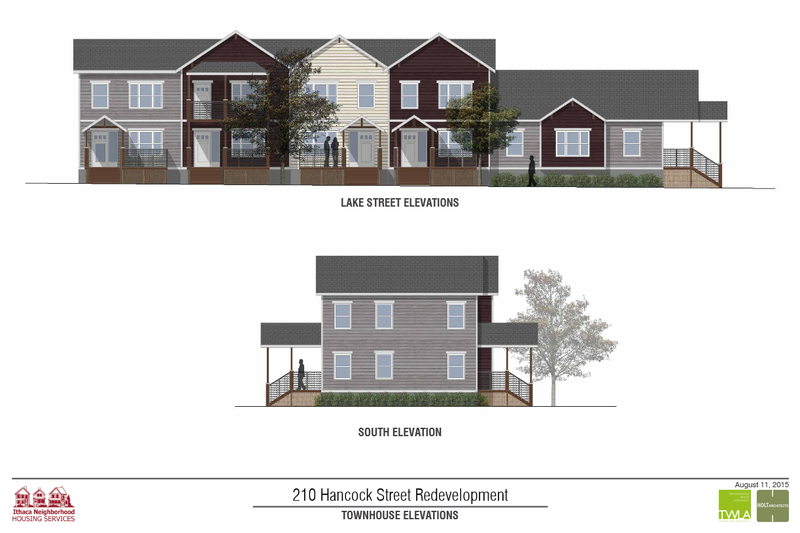 The 202 Hancock townhouses are requesting $567,000 towards a total project cost of $2,359,013. This is a high figure, but it also seems like it would address the recent, very major issue of rapidly rising construction costs derailing multiple affordable housing projects. INHS will be putting up $550,000 of its own money, and already has received a $280,000 city/county/Cornell grant (Community Housing Development Fund) towards the project. The rest comes from bonds, the state, land equity and the buyers themselves. Doing the math ($1,438,640 construction cost, 8,463 SF total), the construction cost budgeted is $170/SF, a little less than the $190/SF they paid for 203 Third Street, but not impossible. Perhaps a larger project of townhouses can utilize cost efficiencies to keep the price down a bit. The two-story wood frame townhouses would be LEED Certified. Five two bedroom units (1,147 SF) would be sold for about $114,000, and the two three-bedroom units (1,364 SF) for $136,000, available to those making 60-80% of local AMI, or $37,000-$49,000/year. The townhouses would be a part of the Community Housing Trust (CHT), keeping them affordable even as they are sold to others in later years. the anticipated construction period is November 2016 – June 2017. HOLT Architects of Ithaca is designing the townhomes. Design wise, they look halfway between the first iteration of the rental townhouses, and the approved version. 2. Also from INHS, the 304 Hector application. The amount requested is $100,000 towards a $369,294 project. This seems remarkably high. In the application, INHS notes the construction costs of $262,000 are from actual bids received from Rick May Construction (who is also doing 203 Third Street) and subcontractors. The math comes out to about $191.50/SF. One of the reasons for the very high cost is that INHS is required to hire contractors with enough liability insurance to cover any major accidents, and a lot of smaller builders don’t have enough insurance. $40,000 has already been granted towards the project from the CHDF. The house would sell for $142,000 to a family making $37,000-$49,000/year (60-80% AMI), the same parameters as the 202 Hancock townhouses. The house would also be a part of the CHT. An April 2017 – January 2018 construction is planned. Local company STREAM Collaborative is the house’s architect. 3. Meanwhile, at the 402 South Cayuga Street site, developer/architect Zac Boggs and Isabel Fernandez are requesting $105,000 towards their 4-unit townhouse project, priced out at $1,020,000, of which $820,000 is for construction. Of the 4 units, one two-bedroom unit will be available to a family making 80% AMI or less (i.e. $49,000/year or less), selling at $150,000. The other three units, 2 2-bedroom and 1 3-bedroom, would be rented out for 2-5 years, and then sold on the “lower-end of market-rate”, which is estimated in the mid to upper $200s. The units would follow LEED standards, and the affordable unit would be put into the CHT. Precision Builders of Ithaca would construct the project. A May 2016 – June 2017 build-out is planned, though it doesn’t appear to factor in the planning board approval process. Aside from the grant, most of the funds for the project will come from a bank loan, with $120,000 of their own money and $40,000 in county bond funds. Assuming these are the same size as the 2 and 3-bedroom INHS townhouses, the construction cost comes out to about $170/SF. One thing that comes to mind in the context of the inclusionary zoning debate is that this might be the only way to really go in the long-term. If INHS gets priced out of feasibility in the city, trying to cover the cost of affordable units with substantially more expensive market units might be the only option, which is a rather uncomfortable thought. One of the issues with inclusionary zoning is that it prices out the middle; developers have to make up the cost somewhere, and the market-rate units are the scapegoats. Communities end up with a small portion of affordable housing, but mostly expensive housing. With this project, part of the money is being recuperated by renting the other units for at least a few years, which some may scoff at, but costs are, what they are. 4. Habitat for Humanity is requesting $75,000 towards their $305,500 duplex project at 101-107 Morris Street (to be redesignated 202-204 Third Street) on the Northside. Each unit will sell to a familiar making less than 60% AMI ($36,750/year), and the families will have to put in “sweat equity”, helping to build the houses (350 hours of labor). To keep costs down, labor is volunteer-based and materials are donated – as a result, the project only has a $180,000 construction cost, a little over $60/SF. The units will be two-story, have porches and designed to fit into the neighborhood. The state has given the project a $70,000 grant already, and the city/county/Cornell CHDF has given $80,000. the rest is covered by corporate grants (Cargill, Lowe’s, M&T Bank) and individual donations. A timeline of April 2017 – April 2018 is anticipated. No renders, but the above site plan was included in the application. 5. Last, the only truly new project for this post. 622 West Clinton Street in the South Side neighborhood. The applicant, Jerame Hawkins, proposes deconstructing a decaying barn at the rear of the property and replacing it with an affordable owner-occupied duplex. Hawkins, who runs the county’s Youth Advocate Program, would make each unit available to a family making 60% AMI or less ($36,750/year or less), in particular Section 8. The duplex would be modular, 3-beds and 1,561 SF each, with Carina Construction and Finger Lakes ReUse working with Hawkins on the project. The construction cost of $292k works out to about $93/SF. The house at the front of the property, which dates from the late 1800s, would be renovated and retained as affordable housing. Hawkins is requesting a grant of $135,000 towards the $364,634 project. A project timeline of October 2016 – January 2017 is given in the application. The one potential red flag I’m seeing is a line in the app that says “retaining for a minimal [sic] of 1 year”. Either that gets clarified and extended, or the IURA won’t be interested this proposal on account of it not being affordable for long enough a period of time.